What is GERD or acid reflux? What are the symptoms of uncomplicated GERD? How is GERD or acid reflux diagnosed and evaluated? How is GERD (acid reflux) treated? What is a reasonable approach to the management of GERD (acid reflux)? What are the unresolved issues in GERD (acid reflux)? GERD (gastroesophageal reflux disease) is a condition in which the acidified liquid content of the stomach backs up into the esophagus. The cause of GERD is complex and may involve multiple causes. GERD may damage the lining of the esophagus, thereby causing inflammation (esophagitis), although this is uncommon. a collection of fluid in the sinuses and middle ear. GERD may be diagnosed or evaluated by a variety of procedures and tests. GERD is treated with life-style changes, diet, over-the-counter (OTC) and prescription drugs (for example, antacids, proton pump inhibitors (PPIs), pro-motility drugs), and surgery. GERD or acid reflux symptoms are caused by the regurgitation of acidic liquid stomach contents back up into the esophagus. The most common symptom of GERD is heartburn. In fact, reflux of the stomach's liquid contents into the esophagus occurs in most normal individuals. One study found that reflux occurs as frequently in normal individuals as in patients with GERD. In patients with GERD, however, the refluxed liquid contains acid more often, and the acid remains in the esophagus longer. It has also been found that liquid refluxes to a higher level in the esophagus in patients with GERD than normal individuals. Gravity, swallowing, and saliva are important protective mechanisms for the esophagus, but they are effective only when individuals are in the upright position. At night during sleep, gravity has no effect, swallowing stops, and the secretion of saliva is reduced. Therefore, reflux that occurs at night is more likely to result in acid remaining in the esophagus longer and causing greater damage to the esophagus. Certain conditions make a person susceptible to GERD. For example, GERD can be a serious problem during pregnancy. The elevated hormone levels of pregnancy probably cause reflux by lowering the pressure in the lower esophageal sphincter (see below). At the same time, the growing fetus increases the pressure in the abdomen. Both of these effects would be expected to increase reflux. Also, patients with diseases that weaken the esophageal muscles, such as scleroderma or mixed connective tissue diseases, are more prone to develop GERD. 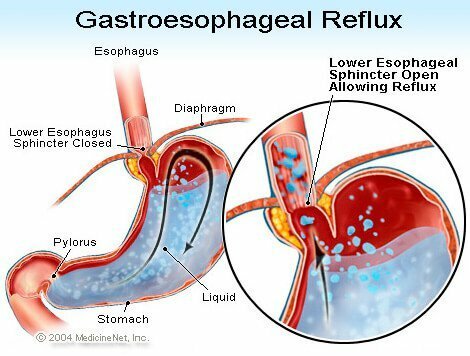 The action of the lower esophageal sphincter (LES) is perhaps the most important factor (mechanism) for preventing reflux. The esophagus is a muscular tube that extends from the lower throat to the stomach. The LES is a specialized ring of muscle that surrounds the lower-most end of the esophagus where it joins the stomach. The muscle that makes up the LES is active most of the time, that is, at rest. This means that it is contracting and closing off the passage from the esophagus into the stomach. This closing of the passage prevents reflux. When food or saliva is swallowed, the LES relaxes for a few seconds to allow the food or saliva to pass from the esophagus into the stomach, and then it closes again. The most recently-described abnormality in patients with GERD is laxity of the LES. Specifically, similar distending pressures open the LES more in patients with GERD than in individuals without GERD. At least theoretically, this would allow easier opening of the LES and/or greater backward flow of acid into the esophagus when the LES is open. Hiatal hernias contribute to reflux, although the way in which they contribute is not clear. A majority of patients with GERD have hiatal hernias, but many do not. Therefore, it is not necessary to have a hiatal hernia in order to have GERD. 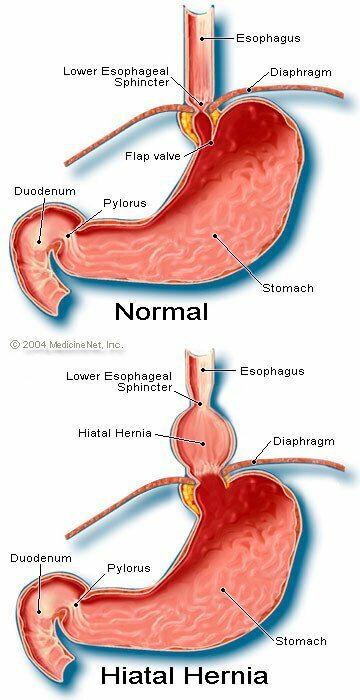 Moreover, many people have hiatal hernias but do not have GERD. It is not known for certain how or why hiatal hernias develop. Normally, the LES is located at the same level where the esophagus passes from the chest through a small opening in the diaphragm and into the abdomen. (The diaphragm is a muscular, horizontal partition that separates the chest from the abdomen.) When there is a hiatal hernia, a small part of the upper stomach that attaches to the esophagus pushes up through the diaphragm. As a result, a small part of the stomach and the LES come to lie in the chest, and the LES is no longer at the level of the diaphragm. It appears that the diaphragm that surrounds the LES is important in preventing reflux. That is, in individuals without hiatal hernias, the diaphragm surrounding the esophagus is continuously contracted, but then relaxes with swallows, just like the LES. Note that the effects of the LES and diaphragm occur at the same location in patients without hiatal hernias. Therefore, the barrier to reflux is equal to the sum of the pressures generated by the LES and the diaphragm. When the LES moves into the chest with a hiatal hernia, the diaphragm and the LES continue to exert their pressures and barrier effect. However, they now do so at different locations. Consequently, the pressures are no longer additive. Instead, a single, high-pressure barrier to reflux is replaced by two barriers of lower pressure, and reflux thus occurs more easily. So, decreasing the pressure barrier is one way that a hiatal hernia can contribute to reflux. As previously mentioned, swallows are important in eliminating acid in the esophagus. Swallowing causes a ring-like wave of contraction of the esophageal muscles, which narrows the lumen (inner cavity) of the esophagus. The contraction, referred to as peristalsis, begins in the upper esophagus and travels to the lower esophagus. It pushes food, saliva, and whatever else is in the esophagus into the stomach. When the wave of contraction is defective, refluxed acid is not pushed back into the stomach. In patients with GERD, several abnormalities of contraction have been described. For example, waves of contraction may not begin after each swallow or the waves of contraction may die out before they reach the stomach. Also, the pressure generated by the contractions may be too weak to push the acid back into the stomach. Such abnormalities of contraction, which reduce the clearance of acid from the esophagus, are found frequently in patients with GERD. In fact, they are found most frequently in those patients with the most severe GERD. The effects of abnormal esophageal contractions would be expected to be worse at night when gravity is not helping to return refluxed acid to the stomach. Note that smoking also substantially reduces the clearance of acid from the esophagus. This effect continues for at least 6 hours after the last cigarette. lithium (Eskalith, Lithobid), nicotine and progesterone. Individuals should not stop taking these or any drugs that are prescribed until the prescribing doctor has discussed the potential GERD situation with them. Other symptoms occur when there are complications of GERD and will be discussed with the complications. When acid refluxes back into the esophagus in patients with GERD, nerve fibers in the esophagus are stimulated. This nerve stimulation results most commonly in heartburn, the pain that is characteristic of GERD. Heartburn usually is described as a burning pain in the middle of the chest. It may start high in the abdomen or may extend up into the neck. In some patients, however, the pain may be sharp or pressure-like, rather than burning. Such pain can mimic heart pain (angina). In other patients, the pain may extend to the back. Since acid reflux is more common after meals, heartburn is more common after meals. Heartburn is also more common when individuals lie down because without the effects of gravity, reflux occurs more easily, and acid is returned to the stomach more slowly. Many patients with GERD are awakened from sleep by heartburn. Episodes of heartburn tend to happen periodically. This means that the episodes are more frequent or severe for a period of several weeks or months, and then become less frequent or severe or even absent for several weeks or months. This periodicity of symptoms provides the rationale for intermittent treatment in patients with GERD who do not have esophagitis. Nevertheless, heartburn is a life-long problem, and it almost always returns. Regurgitation is the appearance of refluxed liquid in the mouth. In most patients with GERD, usually only small quantities of liquid reach the esophagus, and the liquid remains in the lower esophagus. Occasionally in some patients with GERD, larger quantities of liquid, sometimes containing food, are refluxed and reach the upper esophagus. At the upper end of the esophagus is the upper esophageal sphincter (UES). The UES is a circular ring of muscle that is very similar in its actions to the LES. That is, the UES prevents esophageal contents from backing up into the throat. When small amounts of refluxed liquid and/or foods get past the UES and enter the throat, there may be an acid taste in the mouth. If larger quantities breach the UES, patients may suddenly find their mouths filled with the liquid or food. What's more, frequent or prolonged regurgitation can lead to acid-induced erosions of the teeth. Nausea is uncommon in GERD. In some patients, however, it may be frequent or severe and may result in vomiting. In fact, in patients with unexplained nausea and/or vomiting, GERD is one of the first conditions to be considered. It is not clear why some patients with GERD develop mainly heartburn and others develop mainly nausea. Long-standing and/or severe GERD causes changes in the cells that line the esophagus in some patients. These cells are pre-cancerous and may, though usually, become cancerous. This condition is referred to as Barrett's esophagus and occurs in approximately 10% of patients with GERD. The type of esophageal cancer associated with Barrett's esophagus (adenocarcinoma) is increasing in frequency. It is not clear why some patients with GERD develop Barrett's esophagus, but most do not. Barrett's esophagus can be recognized visually at the time of an endoscopy and confirmed by microscopic examination of the lining cells. Then, patients with Barrett's esophagus can undergo periodic surveillance endoscopies with biopsies although there is not agreement as to which patients require surveillance. The purpose of surveillance is to detect progression from pre-cancer to more cancerous changes so that cancer-preventing treatment can be started. It also is believed that patients with Barrett's esophagus should receive maximum treatment for GERD to prevent further damage to the esophagus. Procedures are being studied that remove the abnormal lining cells. Several endoscopic, non-surgical techniques can be used to remove the cells. These techniques are attractive because they do not require surgery; however, there are associated with complications, and the long-term effectiveness of the treatments has not yet been determined. Surgical removal of the esophagus is always an option. Many nerves are in the lower esophagus. Some of these nerves are stimulated by the refluxed acid, and this stimulation results in pain (usually heartburn). Other nerves that are stimulated do not produce pain. Instead, they stimulate yet other nerves that provoke coughing. In this way, refluxed liquid can cause coughing without ever reaching the throat! In a similar manner, reflux into the lower esophagus can stimulate esophageal nerves that connect to and can stimulate nerves going to the lungs. These nerves to the lungs then can cause the smaller breathing tubes to narrow, resulting in an attack of asthma. Although GERD may cause cough, it is not a common cause of unexplained coughing. Although GERD also may be a cause of asthma, it is more likely that it precipitates asthmatic attacks in patients who already have asthma. Although chronic cough and asthma are common ailments, it is not clear just how often they are aggravated or caused by GERD. If refluxed liquid gets past the upper esophageal sphincter, it can enter the throat (pharynx) and even the voice box (larynx). The resulting inflammation can lead to a sore throat and hoarseness. As with coughing and asthma, it is not clear just how commonly GERD is responsible for otherwise unexplained inflammation of the throat and larynx. Refluxed liquid that passes from the throat (pharynx) and into the larynx can enter the lungs (aspiration). The reflux of liquid into the lungs (called aspiration) often results in coughing and choking. Aspiration, however, also can occur without producing these symptoms. With or without these symptoms, aspiration may lead to infection of the lungs and result in pneumonia. This type of pneumonia is a serious problem requiring immediate treatment. When aspiration is unaccompanied by symptoms, it can result in a slow, progressive scarring of the lungs (pulmonary fibrosis) that can be seen on chest X-rays. Aspiration is more likely to occur at night because that is when the processes (mechanisms) that protect against reflux are not active and the coughing reflex that protects the lungs also is not active. The throat communicates with the nasal passages. In small children, two patches of lymph tissue, called the adenoids, are located where the upper part of the throat joins the nasal passages. The passages from the sinuses and the tubes from the middle ears (Eustachian tubes) open into the rear of the nasal passages near the adenoids. Refluxed liquid that enters the upper throat can inflame the adenoids and cause them to swell. The swollen adenoids then can block the passages from the sinuses and the Eustachian tubes. When the sinuses and middle ears are closed off from the nasal passages by the swelling of the adenoids, fluid accumulates within them. This accumulation of fluid can lead to discomfort in the sinuses and ears. Since the adenoids are prominent in young children, and not in adults, this fluid accumulation in the ears and sinuses is seen in children and not adults. There are a variety of procedures, tests, and evaluation of symptoms (for example, heartburn) to diagnose and evaluate patients with GERD. The usual way that GERD is by its characteristic symptom, heartburn. Heartburn is most frequently described as a sub-sternal (under the middle of the chest) burning that occurs after meals and often worsens when lying down. To confirm the diagnosis, physicians often treat patients with medications to suppress the production of acid by the stomach. If the heartburn then is diminished to a large extent, the diagnosis of GERD is considered confirmed. This approach of making a diagnosis on the basis of a response of the symptoms to treatment is commonly called a therapeutic trial. There are problems with this approach For instance, patients who have conditions that can mimic GERD, specifically duodenal or gastric (stomach) ulcers, also can actually respond to such treatment. In this situation, if the physician assumes that the problem is GERD, the cause of the ulcer disease would be missed such as a type of infection called Helicobacter pylori (H. pylori), or nonsteroidal anti-inflammatory drugs or NSAIDS (for example, ibuprofen), can also cause ulcers and these conditions would be treated differently from GERD. Moreover, as with any treatment, there is perhaps a 20% placebo effect, which means that 20% of patients will respond to a placebo (inactive) pill or, indeed, to any treatment. This means that 20% of patients who have causes of their symptoms other than GERD (or ulcers) will have a decrease in their symptoms after receiving the treatment for GERD. Thus, on the basis of their response to treatment (the therapeutic trial), these patients then will continue to be treated for GERD, even though they do not have GERD. What's more, the true cause of their symptoms will not be pursued. Upper gastrointestinal endoscopy (also known as esophago-gastro-duodenoscopy or EGD) is a common way of diagnosing GERD. EGD is a procedure in which a tube containing an optical system for visualization is swallowed. As the tube progresses down the gastrointestinal tract, the lining of the esophagus, stomach, and duodenum can be examined. The esophagus of most patients with symptoms of reflux looks normal. Therefore, in most patients, endoscopy will not help in the diagnosis of GERD. However, sometimes the lining of the esophagus appears inflamed (esophagitis). Moreover, if erosions (superficial breaks in the esophageal lining) or ulcers (deeper breaks in the lining) are seen, a diagnosis of GERD can be made confidently. Endoscopy will also identify several of the complications of GERD, specifically, ulcers, strictures, and Barrett's esophagus. Biopsies also may be obtained. Finally, other common problems that may be causing GERD like symptoms can be diagnosed (for example ulcers, inflammation, or cancers of the stomach or duodenum) with EGD. Biopsies of the esophagus that are obtained through the endoscope are not considered very useful for diagnosing GERD. They are useful, however, in diagnosing cancers or causes of esophageal inflammation other than acid reflux, particularly infections. Moreover, biopsies are the only means of diagnosing the cellular changes of Barrett's esophagus. More recently, it has been suggested that even in patients with GERD whose esophagi appear normal to the eye, biopsies will show widening of the spaces between the lining cells, possibly an indication of damage. It is too early to conclude, however, that seeing widening is specific enough to be confidently that GERD is present. When GERD affects the throat or larynx and causes symptoms of cough, hoarseness, or sore throat, patients often visit an ear, nose, and throat (ENT) specialist. The ENT specialist frequently finds signs of inflammation of the throat or larynx. Although diseases of the throat or larynx usually are the cause of the inflammation, sometimes GERD can be the cause. Accordingly, ENT specialists often try acid-suppressing treatment to confirm the diagnosis of GERD. This approach, however, has the same problems as discussed above, that result from using the response to treatment to confirm GERD. Esophageal acid testing is considered a "gold standard" for diagnosing GERD. As discussed previously, the reflux of acid is common in the general population. However, patients with the symptoms or complications of GERD have reflux of more acid than individuals without the symptoms or complications of GERD. Moreover, normal individuals and patients with GERD can be distinguished moderately well from each other by the amount of time that the esophagus contains acid. The amount of time that the esophagus contains acid is determined by a test called a 24-hour esophageal pH test. (pH is a mathematical way of expressing the amount of acidity.) For this test, a small tube (catheter) is passed through the nose and positioned in the esophagus. On the tip of the catheter is a sensor that senses acid. The other end of the catheter exits from the nose, wraps back over the ear, and travels down to the waist, where it is attached to a recorder. Each time acid refluxes back into the esophagus from the stomach, it stimulates the sensor and the recorder records the episode of reflux. After a 20 to 24 hour period of time, the catheter is removed and the record of reflux from the recorder is analyzed. pH testing has uses in the management of GERD other than just diagnosing GERD. For example, the test can help determine why GERD symptoms do not respond to treatment. Perhaps 10 to 20 percent of patients will not have their symptoms substantially improved by treatment for GERD. This lack of response to treatment could be caused by ineffective treatment. This means that the medication is not adequately suppressing the production of acid by the stomach and is not reducing acid reflux. Alternatively, the lack of response can be explained by an incorrect diagnosis of GERD. In both of these situations, the pH test can be very useful. If testing reveals substantial reflux of acid while medication is continued, then the treatment is ineffective and will need to be changed. If testing reveals good acid suppression with minimal reflux of acid, the diagnosis of GERD is likely to be wrong and other causes for the symptoms need to be sought. Lastly, pH testing can be used to evaluate patients prior to endoscopic or surgical treatment for GERD. As discussed above, some 20% of patients will have a decrease in their symptoms even though they don't have GERD (the placebo effect). Prior to endoscopic or surgical treatment, it is important to identify these patients because they are not likely to benefit from the treatments. The pH study can be used to identify these patients because they will have normal amounts of acid reflux. The advantage of the capsule over standard pH testing is that there is no discomfort from a catheter that passes through the throat and nose. Moreover, with the capsule, patients look normal (they don't have a catheter protruding from their noses) and are more likely to go about their daily activities, for example, go to work, without feeling self-conscious. Because the capsule records for a longer period than the catheter (48 versus 24 hours), more data on acid reflux and symptoms are obtained. Nevertheless, it is not clear whether obtaining additional information is important. Capsule pH testing is expensive. Sometimes the capsule does not attach to the esophagus or falls off prematurely. For periods of time the receiver may not receive signals from the capsule, and some of the information about reflux of acid may be lost. Occasionally there is pain with swallowing after the capsule has been placed, and the capsule may need to be removed endoscopically. Use of the capsule is an exciting use of new technology although it has its own specific problems. Esophageal motility testing has two important uses in evaluating GERD. The first is in evaluating symptoms that do not respond to treatment for GERD since the abnormal function of the esophageal muscle sometimes causes symptoms that resemble the symptoms of GERD. Motility testing can identify some of these abnormalities and lead to a diagnosis of an esophageal motility disorder. The second use is evaluation prior to surgical or endoscopic treatment for GERD. In this situation, the purpose is to identify patients who also have motility disorders of the esophageal muscle. The reason for this is that in patients with motility disorders, some surgeons will modify the type of surgery they perform for GERD. Gastric emptying studies are studies that determine how well food empties from the stomach. As discussed above, about 20 % of patients with GERD have slow emptying of the stomach that may be contributing to the reflux of acid. For gastric emptying studies, the patient eats a meal that is labeled with a radioactive substance. A sensor that is similar to a Geiger counter is placed over the stomach to measure how quickly the radioactive substance in the meal empties from the stomach. Information from the emptying study can be useful for managing patients with GERD. For example, if a patient with GERD continues to have symptoms despite treatment with the usual medications, doctors might prescribe other medications that speed-up emptying of the stomach. Alternatively, in conjunction with GERD surgery, they might do a surgical procedure that promotes a more rapid emptying of the stomach. Nevertheless, it is still debated whether a finding of reduced gastric emptying should prompt changes in the surgical treatment of GERD. Symptoms of nausea, vomiting, and regurgitation may be due either to abnormal gastric emptying or GERD. An evaluation of gastric emptying, therefore, may be useful in identifying patients whose symptoms are due to abnormal emptying of the stomach rather than to GERD. The acid perfusion (Bernstein) test is used to determine if chest pain is caused by acid reflux. For the acid perfusion test, a thin tube is passed through one nostril, down the back of the throat, and into the middle of the esophagus. A dilute, acid solution and a physiologic salt solution (similar to the fluid that bathes the body's cells) are alternately poured (perfused) through the catheter and into the esophagus. The patient is unaware of which solution is being infused. If the perfusion with acid provokes the patient's usual pain and perfusion of the salt solution produces no pain, it is likely that the patient's pain is caused by acid reflux. The acid perfusion test, however, is used only rarely. A better test for correlating pain and acid reflux is a 24-hour esophageal pH or pH capsule study during which patients note when they are having pain. It then can be determined from the pH recording if there was an episode of acid reflux at the time of the pain. This is the preferable way of deciding if acid reflux is causing a patient's pain. It does not work well, however, for patients who have infrequent pain, for example every two to three days, which may be missed by a one or two day pH study. In these cases, an acid perfusion test may be reasonable. One of the simplest treatments for GERD is referred to as life-style changes, a combination of several changes in habit, particularly related to eating. As discussed above, reflux of acid is more injurious at night than during the day. At night, when individuals are lying down, it is easier for reflux to occur. The reason that it is easier is because gravity is not opposing the reflux, as it does in the upright position during the day. In addition, the lack of an effect of gravity allows the refluxed liquid to travel further up the esophagus and remain in the esophagus longer. These problems can be overcome partially by elevating the upper body in bed. The elevation is accomplished either by putting blocks under the bed's feet at the head of the bed or, more conveniently, by sleeping with the upper body on a foam rubber wedge. These maneuvers raise the esophagus above the stomach and partially restore the effects of gravity. It is important that the upper body and not just the head be elevated. Elevating only the head does not raise the esophagus and fails to restore the effects of gravity. Elevation of the upper body at night generally is recommended for all patients with GERD. Nevertheless, most patients with GERD have reflux only during the day and elevation at night is of little benefit for them. It is not possible to know for certain which patients will benefit from elevation at night unless acid testing clearly demonstrates night reflux. However, patients who have heartburn, regurgitation, or other symptoms of GERD at night are probably experiencing reflux at night and definitely should elevate their upper body when sleeping. Reflux also occurs less frequently when patients lie on their left rather than their right sides. Fatty foods (which should be decreased) and smoking (which should be stopped) also reduce the pressure in the sphincter and promote reflux. In addition, patients with GERD may find that other foods aggravate their symptoms. Examples are spicy or acid-containing foods, like citrus juices, carbonated beverages, and tomato juice. These foods should also be avoided if they provoke symptoms. One novel approach to the treatment of GERD is chewing gum. Chewing gum stimulates the production of more bicarbonate-containing saliva and increases the rate of swallowing. After the saliva is swallowed, it neutralizes acid in the esophagus. In effect, chewing gum exaggerates one of the normal processes that neutralize acid in the esophagus. It is not clear, however, how effective chewing gum is in treating heartburn. Nevertheless, chewing gum after meals is certainly worth a try. There are a variety of over-the-counter (for example, antacids and foam barriers) and prescription medications (for example, proton pump inhibitors, histamine antagonists, and promotility drugs) for treating GERD. Antacids may be aluminum, magnesium, or calcium based. Calcium-based antacids (usually calcium carbonate), unlike other antacids, stimulate the release of gastrin from the stomach and duodenum. Gastrin is the hormone that is primarily responsible for the stimulation of acid secretion by the stomach. Therefore, the secretion of acid rebounds after the direct acid-neutralizing effect of the calcium carbonate is exhausted. The rebound is due to the release of gastrin, which results in an overproduction of acid. Theoretically at least, this increased acid is not good for GERD. Acid rebound, however, has not been shown to be clinically important. That is, treatment with calcium carbonate has not been shown to be less effective or safe than treatment with antacids not containing calcium carbonate. Nevertheless, the phenomenon of acid rebound is theoretically harmful. In practice, therefore, calcium-containing antacids such as Tums and Rolaids are not recommended for frequent use. The occasional use of these calcium carbonate-containing antacids, however, is not believed to be harmful. The advantages of calcium carbonate-containing antacids are their low cost, the calcium they add to the diet, and their convenience as compared to liquids. Aluminum-containing antacids have a tendency to cause constipation, while magnesium-containing antacids tend to cause diarrhea. If diarrhea or constipation becomes a problem, it may be necessary to switch antacids, or alternatively, use antacids containing both aluminum and magnesium. Although antacids can neutralize acid, they do so for only a short period of time. 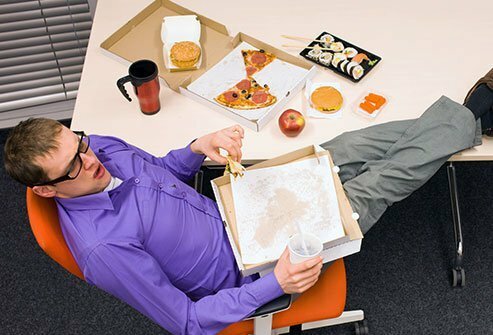 For substantial neutralization of acid throughout the day, antacids would need to be given frequently, at least every hour. As histamine is particularly important for the stimulation of acid after meals, H2 antagonists are best taken 30 minutes before meals. The reason for this timing is so that the H2 antagonists will be at peak levels in the body after the meal when the stomach is actively producing acid. H2 antagonists also can be taken at bedtime to suppress nighttime production of acid. H2 antagonists are very good for relieving the symptoms of GERD, particularly heartburn. However, they are not very good for healing the inflammation (esophagitis) that may accompany GERD. In fact, they are used primarily for the treatment of heartburn in GERD that is not associated with inflammation or complications, such as erosions or ulcers, strictures, or Barrett's esophagus. Four different H2 antagonists are available by prescription, including cimetidine (Tagamet), ranitidine (Zantac), nizatidine (Axid), and famotidine, (Pepcid). All four are also available over-the-counter (OTC), without the need for a prescription. However, the OTC dosages are lower than those available by prescription. The second type of drug developed specifically for acid-related diseases, such as GERD, was a proton pump inhibitor (PPI), specifically, omeprazole (Prilosec). A PPI blocks the secretion of acid into the stomach by the acid-secreting cells. The advantage of a PPI over an H2 antagonist is that the PPI shuts off acid production more completely and for a longer period of time. Not only is the PPI good for treating the symptom of heartburn, but it also is good for protecting the esophagus from acid so that esophageal inflammation can heal. PPIs are used when H2 antagonists do not relieve symptoms adequately or when complications of GERD such as erosions or ulcers, strictures, or Barrett's esophagus exist. Five different PPIs are approved for the treatment of GERD, including omeprazole (Prilosec, Dexilant), lansoprazole (Prevacid), rabeprazole (Aciphex), pantoprazole (Protonix), and esomeprazole (Nexium), and dexlansoprazole (Dexilant). A sixth PPI product consists of a combination of omeprazole and sodium bicarbonate (Zegerid). PPIs (except for Zegarid) are best taken an hour before meals. The reason for this timing is that the PPIs work best when the stomach is most actively producing acid, which occurs after meals. If the PPI is taken before the meal, it is at peak levels in the body after the meal when the acid is being made. Pro-motility drugs work by stimulating the muscles of the gastrointestinal tract, including the esophagus, stomach, small intestine, and/or colon. One pro-motility drug, metoclopramide (Reglan), is approved for GERD. Pro-motility drugs increase the pressure in the lower esophageal sphincter and strengthen the contractions (peristalsis) of the esophagus. Both effects would be expected to reduce reflux of acid. However, these effects on the sphincter and esophagus are small. Therefore, it is believed that the primary effect of metoclopramide may be to speed up emptying of the stomach, which also would be expected to reduce reflux. Pro-motility drugs are most effective when taken 30 minutes before meals and again at bedtime. They are not very effective for treating either the symptoms or complications of GERD. Therefore, the pro-motility agents are reserved either for patients who do not respond to other treatments or are added to enhance other treatments for GERD. The drugs described above usually are effective in treating the symptoms and complications of GERD. Nevertheless, sometimes they are not. For example, despite adequate suppression of acid and relief from heartburn, regurgitation, with its potential for complications in the lungs, may still occur. Moreover, the amounts and/or numbers of drugs that are required for satisfactory treatment are sometimes so great that drug treatment is unreasonable. In such situations, surgery can effectively stop reflux. The surgical procedure that is done to prevent reflux is technically known as fundoplication and is called reflux surgery or anti-reflux surgery. 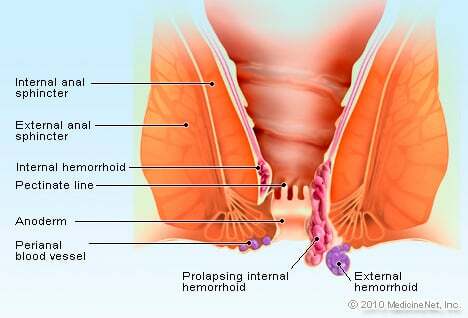 During fundoplication, any hiatal hernial sac is pulled below the diaphragm and stitched there. In addition, the opening in the diaphragm through which the esophagus passes is tightened around the esophagus. Finally, the upper part of the stomach next to the opening of the esophagus into the stomach is wrapped around the lower esophagus to make an artificial lower esophageal sphincter. All of this surgery can be done through an incision in the abdomen (laparotomy) or using a technique called laparoscopy. During laparoscopy, a small viewing device and surgical instruments are passed through several small puncture sites in the abdomen. This procedure avoids the need for a major abdominal incision. Very recently, endoscopic techniques for the treatment of GERD have been developed and tested. One type of endoscopic treatment involves suturing (stitching) the area of the lower esophageal sphincter, which essentially tightens the sphincter. A second type involves the application of radio-frequency waves to the lower part of the esophagus just above the sphincter. The waves cause damage to the tissue beneath the esophageal lining and a scar (fibrosis) forms. The scar shrinks and pulls on the surrounding tissue, thereby tightening the sphincter and the area above it. A third type of endoscopic treatment involves the injection of materials into the esophageal wall in the area of the LES. The injected material is intended to increase pressure in the LES and thereby prevent reflux. In one treatment the injected material was a polymer. Unfortunately, the injection of polymer led to serious complications, and the material for injection is no longer available. Another treatment involving injection of expandable pellets also was discontinued. Limited information is available about a third type of injection which uses gelatinous polymethylmethacrylate microspheres. Endoscopic treatment has the advantage of not requiring surgery. It can be performed without hospitalization. Experience with endoscopic techniques is limited. It is not clear how effective they are, especially long-term. Because the effectiveness and the full extent of potential complications of endoscopic techniques are not clear, it is felt generally that endoscopic treatment should only be done as part of experimental trials. Transient LES relaxations appear to be the most common way in which acid reflux occurs. Although there is an available drug that prevents relaxations (baclofen), it has side effects that are too frequent to be generally useful. Much attention is being directed at the development of drugs that prevent these relaxations without accompanying side effects. There are several ways to approach the evaluation and management of GERD. The approach depends primarily on the frequency and severity of symptoms, the adequacy of the response to treatment, and the presence of complications. For infrequent heartburn, the most common symptom of GERD, life-style changes and an occasional antacid may be all that is necessary. If heartburn is frequent, daily non-prescription-strength (over-the-counter) H2 antagonists may be adequate. A foam barrier also can be used with the antacid or H2 antagonist. anemia (due to bleeding from esophageal inflammation or ulceration). Clues to the presence of diseases that may mimic GERD, such as gastric or duodenal ulcers and esophageal motility disorders, should be sought. If at the time of evaluation, there are symptoms or signs that suggest complicated GERD or a disease other than GERD or if the relief of symptoms with H2 antagonists or PPIs is not satisfactory, a further evaluation by endoscopy (EGD) definitely should be done. There are several possible results of endoscopy and each requires a different approach to treatment. If the esophagus is normal and no other diseases are found, the goal of treatment simply is to relieve symptoms. Therefore, prescription strength H2 antagonists or PPIs are appropriate. If damage to the esophagus (esophagitis or ulceration) is found, the goal of treatment is healing the damage. In this case, PPIs are preferred over H2 antagonists because they are more effective for healing. If complications of GERD, such as stricture or Barrett's esophagus are found, treatment with PPIs also is more appropriate. However, the adequacy of the PPI treatment probably should be evaluated with a 24-hour pH study during treatment with the PPI. (With PPIs, although the amount of acid reflux may be reduced enough to control symptoms, it may still be abnormally high. Therefore, judging the adequacy of suppression of acid reflux by only the response of symptoms to treatment is not satisfactory.) Strictures may also need to be treated by endoscopic dilatation (widening) of the esophageal narrowing. With Barrett's esophagus, periodic endoscopic examination should be done to identify pre-malignant changes in the esophagus. If symptoms of GERD do not respond to maximum doses of PPI, there are two options for management. The first is to perform 24-hour pH testing to determine whether the PPI is ineffective or if a disease other than GERD is likely to be present. If the PPI is ineffective, a higher dose of PPI may be tried. The second option is to go ahead without 24 hour pH testing and to increase the dose of PPI. Another alternative is to add another drug to the PPI that works in a way that is different from the PPI, for example, a pro-motility drug or a foam barrier. If necessary, all three types of drugs can be used. If there is not a satisfactory response to this maximal treatment, 24 hour pH testing should be done. Some physicians - primarily surgeons - recommend that all patients with Barrett's esophagus should have surgery. This recommendation is based on the belief that surgery is more effective than endoscopic surveillance or ablation of the abnormal tissue followed by treatment with acid-suppressing drugs in preventing both the reflux and the cancerous changes in the esophagus. There are no studies, however, demonstrating the superiority of surgery over drugs or ablation for the treatment of GERD and its complications. Moreover, the effectiveness of drug treatment can be monitored with 24 hour pH testing. One unresolved issue in GERD is the inconsistent relationships among acid reflux, heartburn, and damage to the lining of the esophagus (esophagitis and the complications). Why do only a few of the many episodes of acid reflux that occur in a patient with GERD cause heartburn? Why do some patients with mildly increased acid reflux develop heartburn, while other patients with the same amount of acid reflux do not? Why does heartburn usually occur in an esophagus that has no visible damage? Why is it that some patients with more damage to the esophagus have less heartburn than patients with no damage? Is heartburn not related to inflammation but rather to absorption of acid across the lining of the esophagus through widened spaces between the lining cells? Clearly, we have much to learn about the relationship between acid reflux and esophageal damage, and about the processes (mechanisms) responsible for heartburn. This issue is of more than passing interest. Knowledge of the mechanisms that produce heartburn and esophageal damage raises the possibility of new treatments that would target processes other than acid reflux. One of the more interesting theories that has been proposed to answer some of these questions involves the reason for pain when acid refluxes. It often is assumed that the pain is caused by irritating acid contacting an inflamed esophageal lining. But the esophageal lining usually is not inflamed. It is possible therefore, that the acid is stimulating the pain nerves within the esophageal wall just beneath the lining. Although this may be the case, a second explanation is supported by the work of one group of scientists. These scientists find that heartburn provoked by acid in the esophagus is associated with contraction of the muscle in the lower esophagus. Perhaps it is the contraction of the muscle that somehow leads to the pain. It also is possible, however, that the contraction is an epiphenomenon, that is, refluxed acid stimulates pain nerves and causes the muscle to contract, but it is not the contraction that causes the pain. More studies will be necessary before the exact mechanism(s) that causes heartburn is clear. There are potentially injurious agents that can be refluxed other than acid, for example, bile. Until recently it has been impossible or difficult to accurately identify non-acid reflux and, therefore, to study whether or not non-acid reflux is injurious or can cause symptoms. National Institutes of Health. Gastroesophageal reflux disease.